According to the victim, a political argument that began on Facebook ended with one man being shot this week. 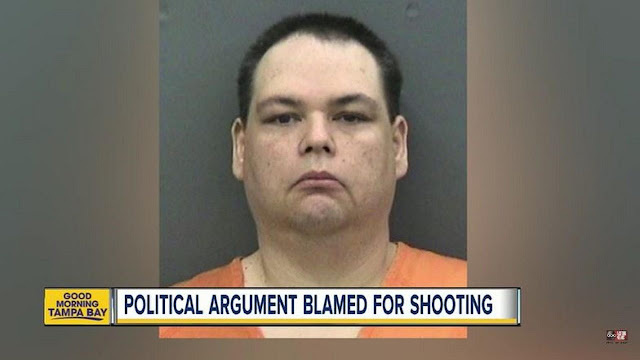 Authorities say the dispute between Alex Stephens, 46, and Brian Sebring, 44, both of Tampa, Florida, reached a crescendo when Sebring drove to Stephens’ house and shot him in the thigh and buttocks. According to the victim’s explanation to police, the confrontation was sparked over a political spat on social media. According to the report, Sebring anticipated that things would escalate, which is why he brought along his Glock for protection. Once at Stephens’ house, Sebring allegedly honked his horn and waited by his truck. When the victim came outside, he reportedly rushed at Sebring’s truck, at which point the accused fired upon him. Stephens ran away and Sebring fled the scene, later turning himself in to police. He was charged with aggravated battery with a deadly weapon and carrying a concealed firearm, posted bond of $9,500 and was released from jail. No evidence of an argument between the two was apparent from either of the men’s public Facebook pages. Both men attended Robinson High School in Tampa, but it’s unclear how they knew each other. Sebring is a registered Democrat, and voting records do not show a registration for Stephens, who is a felon. According to the Tampa Bay Times, jail records show that Sebring is a pizza delivery driver, and his Twitter account describes him as being married with two children.